The Nortel 1200 IP telephone series is a cost-effective IP deskset offering specifically optimized with values and features. The Nortel 1200 IP Phone Series Portfolio consists of three models (Nortel 1220 IP Phone, Nortel 1230 IP Phone, Nortel 1210 IP Phone). 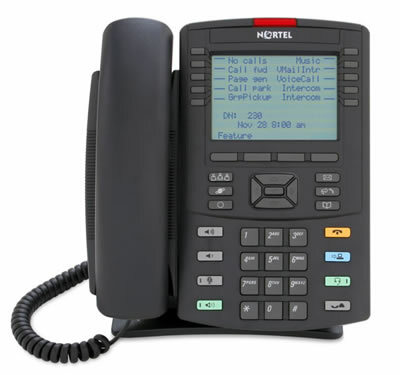 The Nortel 1200 IP Phone Series features include an ergonomic and advanced design, high-quality handsfree speakerphone, character-based displays, new high-density feature/line key deskset model. The Key Expansion Module for the Nortel IP Phone 1200 Series is an accessory to the Nortel IP Phone 1200 Series portfolio. Note: 1200 Series IP Phones are compatible with Nortel BCM and Communication Server platforms. Please ensure your system meets the minimum configuration requirements when ordering these IP phones.